I'm really excited and I can't wait to share these awesome makeup products with you girls. 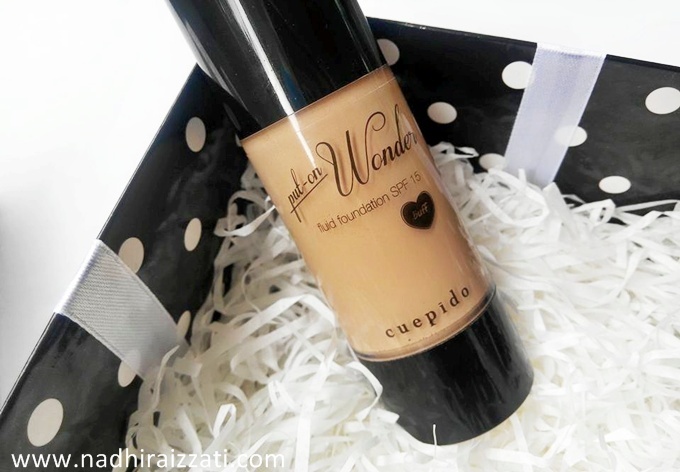 This is my first time ever heard about a brand called Cuepido Cosmetics, and my first impression when I look at their website was, I can't wait to try out their product because they have a very cute packaging and also a cute cupid as their logo. Then, when I started using the products above, all I can say is, I like it a lot! So that is why I wanted to share it with you, thought you might also interest to try it out. 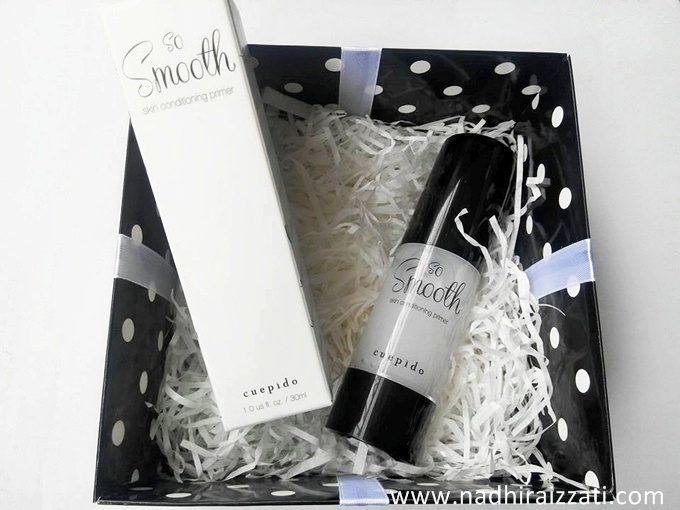 The first product that I want to talk about is the So Smooth, skin conditioning primer. This product is a translucent white shimmer gel primer that fills in a fine line and pores to makes your face smooth and helps your foundation application easier. 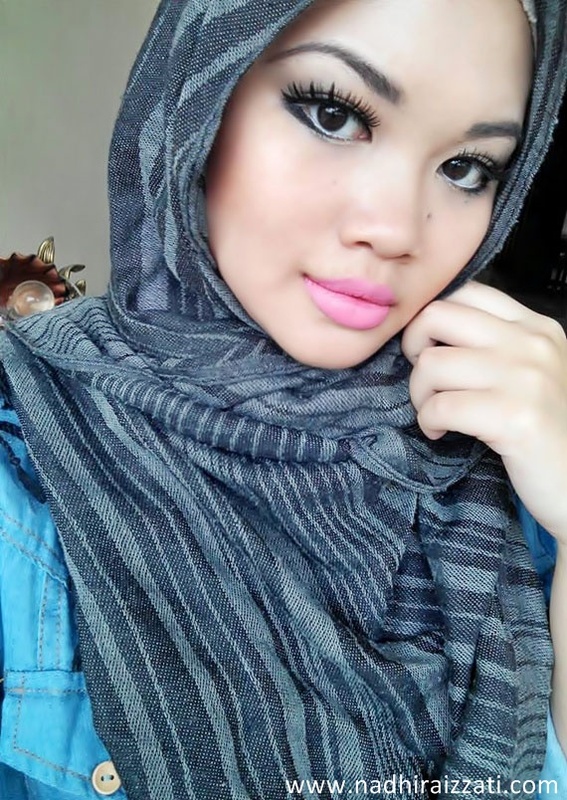 It is also act as a makeup based to help the makeup to stay longer. I must say I love this primer because I only need a very small amount to be applied on my face, and it gives a very wonderful smooth touch. The only thing that I don't like was the shimmer in the gel. It is not really 'visible' though, but I just feel uncomfortable having a shimmery face haha! I don't know about you girls, but as for me, I don't like any face product that has a shimmer or glitter on it. Some people like it that way as it helps giving a glow on their face. Other than the shimmer, I absolutely love this primer. I would totally recommend this product for you. Trust me, your face will feels silky smooth! Gives my skin feeling very smooth and soft. Helps with the foundation application easier afterward. Helps my makeup to stay longer. Contain Vitamin A, C, and E for skin protection. Can be wear alone for skin conditioning. Only need a very small amount. The shimmer in the gel. I like this foundation but I accidentally choose the wrong shade! The one that I got here is a lil bit darker from my skintone. Still wearable actually, but i'm not comfortable using a darker foundation. Too bad. 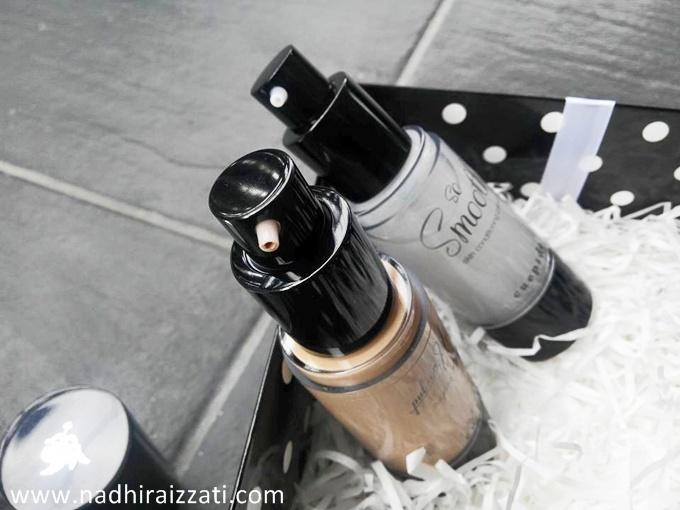 Put-On Wonders liquid foundation actually comes with 5 different shades. I was about to pick the shade 'cream' but I was afraid the colour might be too light for my skintone. And since it is hard to guess which colour suit me best (because I was only referring the picture from their website), so I just playing safe by choosing the colour that not too dark and not too light. *guess I was wrong, huhh?. But it's okay. I can still mix it with a lighter foundation to get the right shade. No problemo! I really love their logo. So cute, right? *I wish they would give their logo as a sticker for their customers so we can stick it everywhere because it's so cute! You can see the colour is pretty intense. 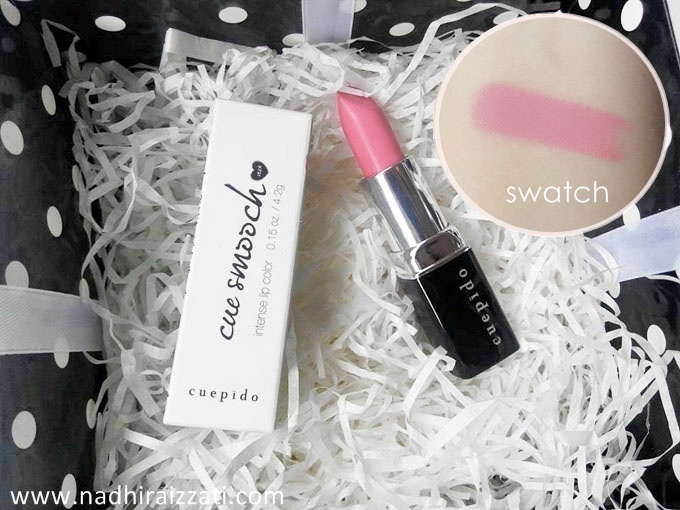 When I applied it on my lips, I can feel the texture is quite creamy but not moisturize enough. Yes it is long lasting, but after few hours, my lips tend to get very dry. Then I look at the description about this product on their website, they mentioned 'wear it after the Cue Smooch-Care for extra moisture'. So if your lips tend to get very dry easily (like mine), you might want to use the product below first, or you can add a moisturizer lip product before applying the Cue Smooch lipstick. 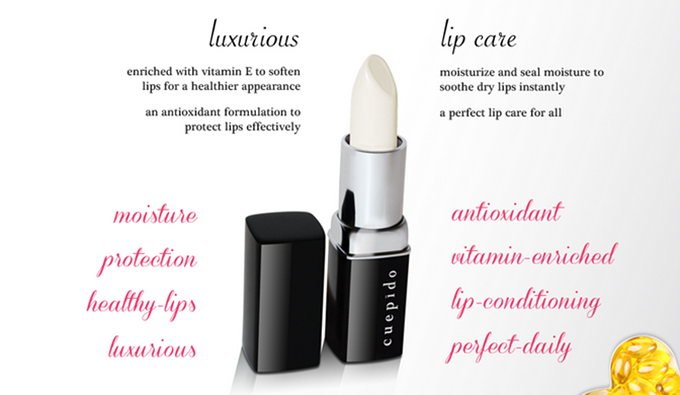 It's like a lip treatment, great for dry chapped lips, and lips with discolouration. If you interested, don't forget to visit their website. I will provide the link down below so you girls can check it out. 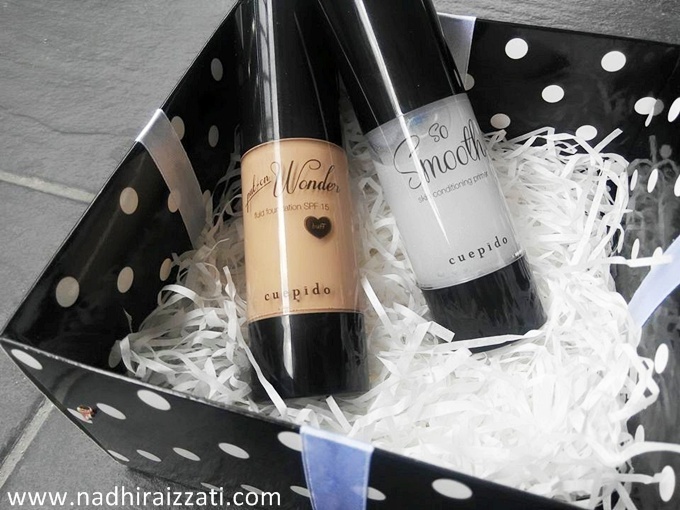 Cuepido Cosmetics is a cruelty-free cosmetics line. No animal tested, and no harmful ingredient. 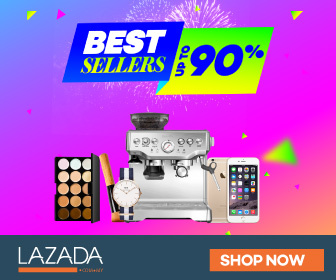 They only offer a skin-loving ingredients such as Aloe Vera, Vitamins, Jojoba Esters, Sunflower seed oil, and others. Notice my face is a bit darker than my hand? 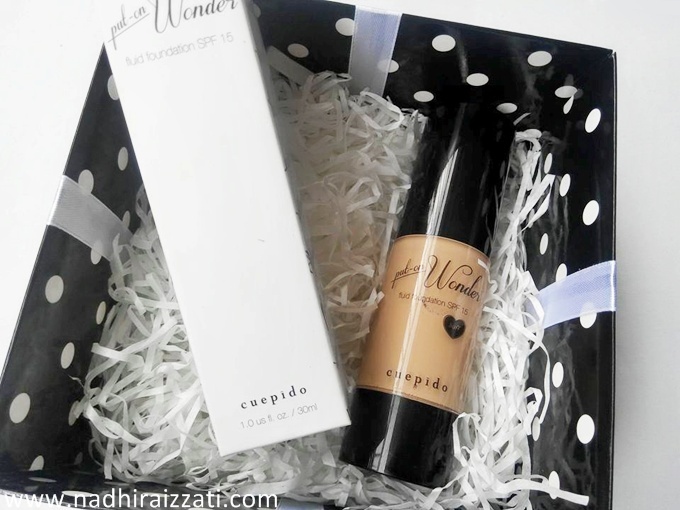 And FYI, Cuepido Cosmetics is now offering a great deal with their Raya 2015 Collection for you girls! 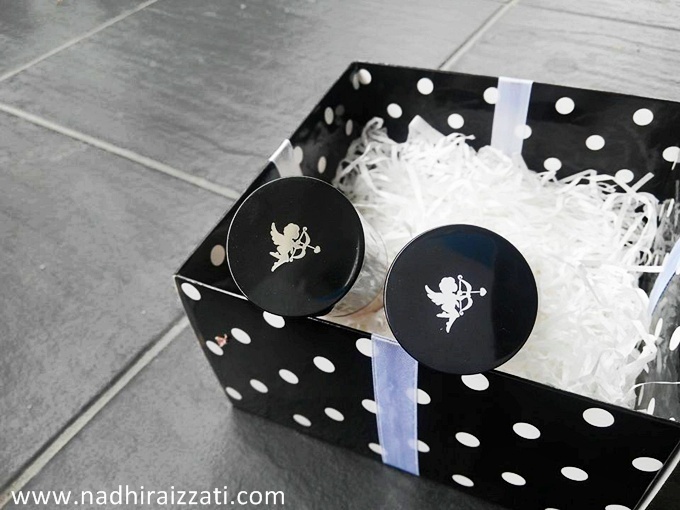 They have four Raya collection of their products that you can choose, so go ahead visit their website for more info. About the So Smooth Conditioning Primer, this is actually my favourite of all three. Although I don't like the shimmer, but I still keep using this product because it makes my skin feels so smooth! Oh speaking of shimmer, I understand that it is actually a natural minerals which perfect to create skin radiance and for the most sensitive skin. They are not synthetic glitters. And the reason why I like this product is because it is a double duty product. It is used as a skin conditioner at the same time perform as face primer. It can be used day and night. Wear as a moisturizer to seal the skin moisture at night, just leave it like a sleeping mask. It will absorb the nutrients. And if you wear this in long-term, you will feel your skin getting softer because it is rich in Jojoba and Vitamins.